It seems that every online site has taken the story and run with it. I find the whole thing pretty amusing. This is not the first time it’s been discussed. As far back as this interview in 2000, Cameron has mentioned that the film has characters that he wouldn’t mind revisiting. Here’s a more recent quote from Paste magazine in October, 2005. It’s all about the writing, man. Could be great, could be terrible. The problem is that the original was so great that anything much *less* than great might seem terrible. I think Cameron would knock it out of the park no matter what, but people get obsessed with that movie and have their own sense of ownership with it, and would fliiiiiiiip out no matter what. The problem with thinking of Rob Gordon (High Fidelity) as an older Lloyd Dobler is that Rob has spent his life afraid to fully commit to anything, while that’s far from the case for Lloyd. Rob could never be a kickboxer and certainly never be comfortable with Diane Court – he’d constantly worry that she’d wake up and realize he wasn’t good enough for her. That’s not an issue for Lloyd who embodies the concept of Optimism as a Revolutionary Act – he’s fully committed to what he wants regardless of the odds of success. They’re very different characters that just happen to be brought to life very well by John Cusack. I’d pay to see Say Anything II (though I’d pay more for it to have its own title), but what I really want is more Optimism as a Revolutionary Act as a movie theme and I get that pretty consistently from Cameron Crowe’s films, so I’m happy regardless of what happens (or doesn’t happen) to Lloyd and Diane. I’m of the mindset that if there’s a story that Cameron wants to tell, with things that he wants to say, I hope he does it. I don’t believe “High Fidelity” would have been a strict blueprint of what a continuation of “Say Anything…” would be. But I could see how the story of how time and relationships shape a character for better or for worse, could remind Cameron of “Say Anything…,” and how he might convey that structure to a continuation of “Say Anything…” since the Lloyd was really an open book–unsure of his place in the world at large but sure of who he believed he belonged to. As a writer Cameron might love to fill those pages in Lloyd’s book. If I were to dream about a sequel to “Say Anything…” my hope is that it would pack the haunting power that other unlikely continuations have had in their second films. I’m thinking of “Before Sunset” or “2046,” in how they not only continued from where “Before Sunrise” and “In the Mood for Love,” respectively, began but were stand alone films of their own that also enriched what came before it. optimism category. Life happened, things fell apart, they grew, they changed…. The film lived in both cynicism and optimism, and while these are perspectives that help one shape the world they see and the life they’re living these characters still strive for happiness and love, no matter from what prism they view things. My hope is that if there’s a continuation to “Say Anything…” that it not be afraid to go down paths that may feel true years later, even if may differ from where the original story began. “Say Anything…” was a film about honestly and dishonesty, disillusionment and hope. It had great joy but also pain. The relationship between Lloyd and Diane was one of great discovery and love, and their own lives were still being shaped to great degrees. Many can change within a relationship, and a relationship can end with one still feeling like their true self in the end. The permutations are endless A continuation of “Say Anything…” can have plenty of surprise. A film like “Before Sunset” showed there is still plenty of story and surprise to such a delicate, small film like “Before Sunrise.” If Cameron has something more to tell about the life of Lloyd Dobbler I hope he tells it. I’d definitely see it. well thought out Joseph. Thanks for sharing and don’t be a stranger! Joseph this is really beautiful writing. “The film lived in both cynicism and optimism… ” So true about “Before Sunset”…. Thanks also for the “In The Mood for Love” reference. One of my favorite films, and filled with a thoughtful poetic sense not unlike what you’ve just written. Wow, thank you so much for your incredibly kind reply. You’ve been a hero of mine since I was 13, and I’m just utterly shocked. Thank you. I hold “Before Sunset” and “In the Mood for Love” in the same kinship of “Say Anything…” in their delicate, finely observed feeling. (Matter of fact “Before Sunset” is my number two film of the past decade, just behind “Almost Famous.”) Last week when I read for the first time in ten years the possibility of a continuation of “Say Anything…” I instantly thought of those films. There is such rich possibility in whatever way you’d like the story to continue, if you decide to do so. Best of luck with whichever direction you choose. It would be pretty incredible if Cameron Crowe could catch an audience up with the truly positive character of John Cusack’s Lloyd Dobler, over twenty years later.. I have to admit, it’s a powerful thing to read the reactions to mentioning that I still think about those characters. I was always so inspired that Francois Truffaut kept returning to Antoine Doinel. If I ever did return to Lloyd, it would probably be a reflection on optimism… what survives, what doesn’t, what happens when a great and true love arrives so early in your life… maybe it’ll be a short story, or maybe it will have all ended with that ding. “Say Anything” is probably my favorite movie I’ve ever done, if only for the great relationships with Laszlo Kovacs and John Cusack and Ione Skye and John Mahoney and more. It all ended up on screen. Just happy to read these wonderful comments. Take care you guys, and thanks again Greg for providing a place to talk about it on a Sunday afternoon. I would love to see you visit that concept anyway, no matter who the character is. 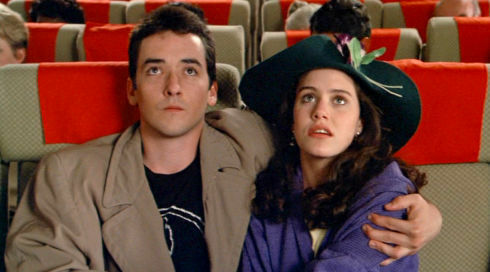 It’s hard when you’re a Lloyd Dobler to stay a Lloyd Dobler when your heart gets broken. And the reality is most first loves don’t really last. Still, I’d like to think they rode off happily into the sunset and all these years later, Lloyd still carries that pen…except he gave it to her Dad dammit! Roddy Doyle did just that when he revisited Jimmy Rabbitte Jr. from The Commitments in the short story “The Deportees”. Jimmy was older, his musical tastes had changed somewhat, but underneath he was still the same person. I think that’s true for most people, though some of us try to hide the parts of our characters that can get us hurt. YES!! That movie is a classic and people love it still. It would also launch a new generation that has never seen it so they could fall in love with the characters. Especially if you write a really good story line and bring back John and Ione. .
guy looks like a young John Cusack. I think that guy might be related to John Cusack or something. However, I’ve heard that John hates that character so he would be perfect to play Lloyd’s part if John backed out. I have always heard that John hates that character although I don’t know if that is true or not. Did John say that he would do a sequel? I was reading the other comments and I would like to see a picture of this guy that looks like Cusack. I suppose if he didn’t want to do it then if the guy looks like John it sounds like you have a replacement. I’ve seen Say Anything at least 20 times. I would loooooooove to see a sequel though, please make it happen! John does not hate Lloyd. He did a Dvd commentary with Cameron a few years ago. Check it out. He had trepidations about playing a high schooler again, but he and Cameron massaged the character and John was in. Not as articulate as my previous posters and can appreciate the deep feeling for this film. Lloyd Dobler is my personal elixir against today’s avalanche of cynicism. I have a thought and a question. I have always believed Lloyd’s Kickboxing prowness was a necessity for him to be able to live his optimistic in a world of angst filled teens. Now a total geeky fan question. Where is the park (I am assuming it’s a park) where the boombox scene takes place? Thank you for providing this forum for all us Dobler disciples! That right there should tell you that you need to start working on this now! It would be a huge box office success and I don’t mean for this to sound disrespectful in any way but if you don’t take this idea and run with it then you are a fool.